You either have a Facebook fan page at this point or you know you need one. At least I hope it’s one of the two. For those of you just starting one, here are some key points, and if you already have one, use this post to check to make sure that you are doing everything right. If you’re still struggling with why you should be active on Facebook, let me say simply that this is the new digital word of mouth. This is how more and more people will find out about the experience of being in your practice from the patient’s perspective. The largest growing segment of Facebook users are 25-39 year olds. And they average more than 6 hours a week, with women spending twice as much time as men. In other words, good potential patients. So let’s start with the basics: a fan page and a personal profile are two different things on Facebook. A page is for your business. You would start here: http://www.facebook.com/pages/create.php. Click on “Local Business or Place” and choose the “Health, Medical, Pharmacy” category. There is no “dentist” category, so you need to create a subcategory in the box below. You can write “dentist” and even two other choices that will all show up. The important thing to do is choose the main category as “Health, Medical, Pharmacy”, which won’t show up on your page, your subcategory will, but it will allow you to have recommendations from patients. More on that later. Fill out EVERYTHING! Your hours, your services, all of it. Especially at the bottom, be sure to put your website, an email address where you can be contacted and your practice phone number. Your USERNAME is important. You only get two shots at this. Once you choose one, you can only change it one time, so choose wisely, and remember that you want it to be short enough to put on a business card. It doesn’t have to be your full practice name or your exact name, but it needs to describe you quickly and accurately, like “HappyToothChicago” or “FredsToothShop”. As close to your website name as possible is helpful as well. The sole purpose of this username is for you to be able to direct people easily to your page. The result will be that if someone puts in www.facebook.com/fredstoothshop in a browser it will go directly to your Facebook page. Be sure to put your Facebook location on your business cards. The next step is to set up permissions. You want to grant wide permissions, because you can always delete any post that someone puts up. You can also set up administrators for the page, besides the dentist, and give them a range of powers with the site. I recommend having at least two other people as administrators, just to be able to post and make changes for you. Add photos. No photos is death on Facebook. (It’s not “Wordbook”.) You will need a good, panoramic shot, probably of your team, for the main photo, and a small logo shot for the lower left corner. 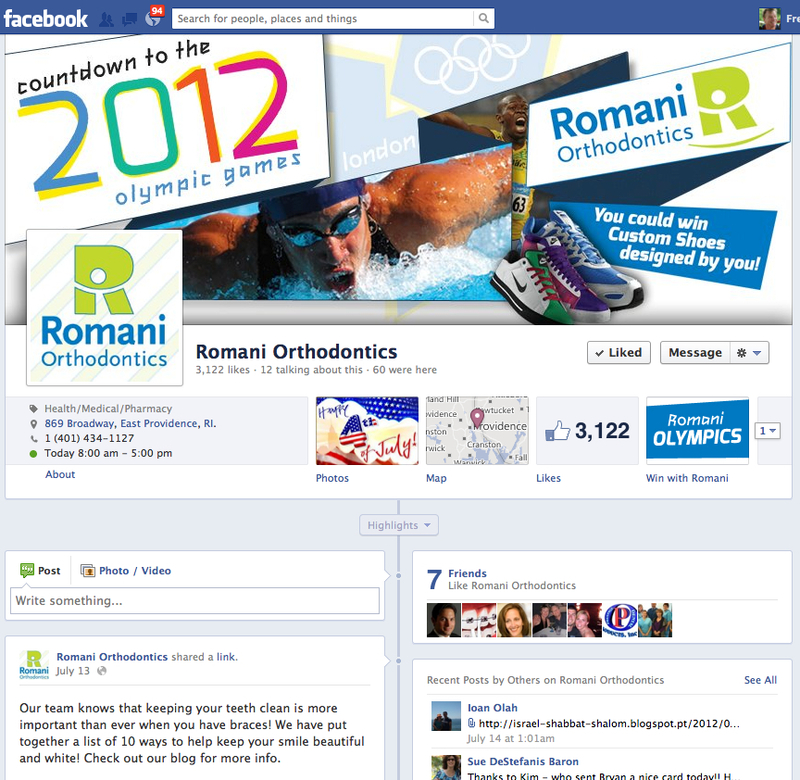 Here are two samples of excellent pages: Spodak Dental has a great team shot here, and Romani Orthodontics is always showing some new contest she’s doing. The four buttons that you see under the large photo can all be moved around and changed, except for photos. If you are a Patient Activator client, we can add a module that will let visitors request an appointment, and it will also post reviews that Patient Activator gathers from your patients, and this will be a button that you can display. 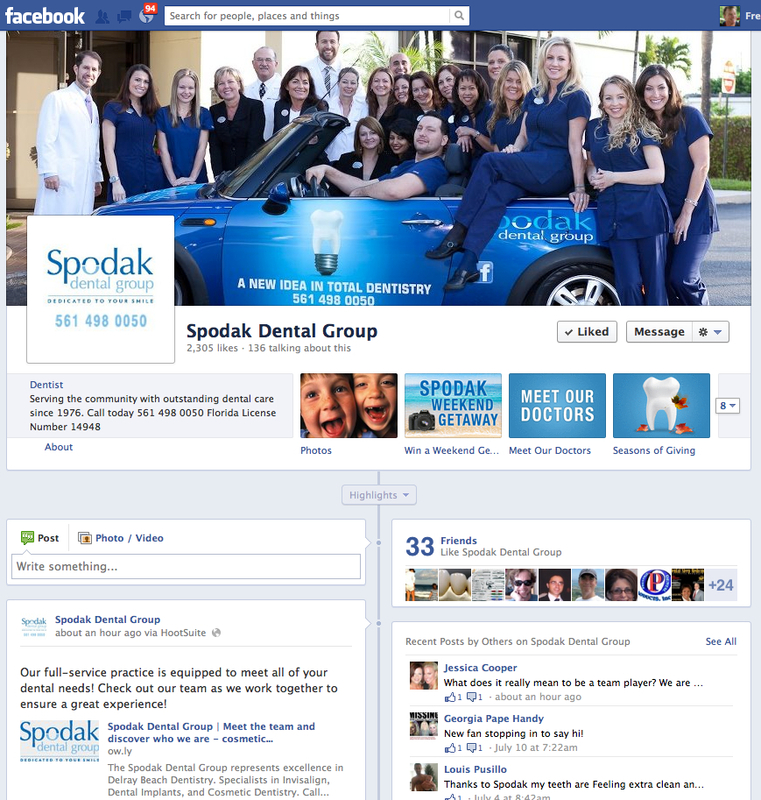 Notice also that in Dr. Spodak’s page he is listed as a dentist (under his logo). This is his subcategory. He has also chosen to write his own section below that. On Romani’s you see that her phone number and address are there. 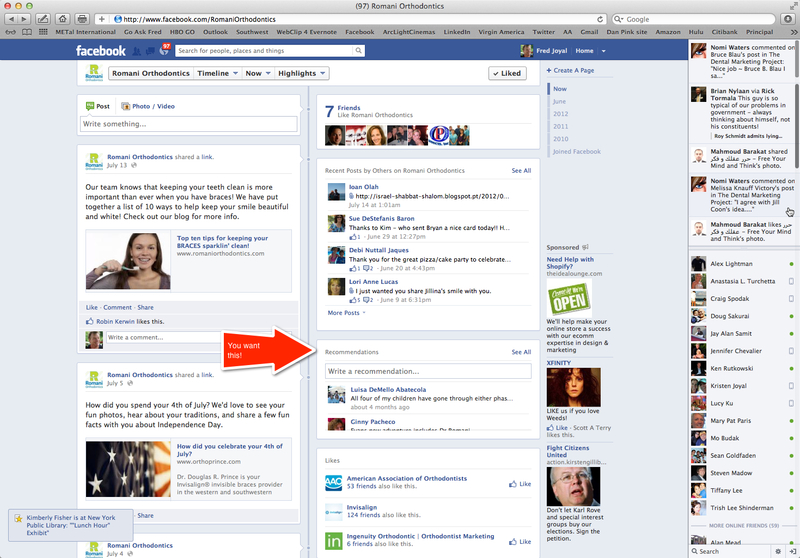 This is the standard Facebook Timeline display. When you click on her address it goes right to a map. Facebook also shows whether you’re open at that moment or not. So your page is up and running. What’s next? Now you need to make it someone’s job in the office to post on a regular basis. NOT the dentist! There is undoubtedly a Facebook geek in your office. Make it part of her job. This person should be checking Facebook every day, commenting whenever a patient posts, and adding posts, photos and occasional videos. You also need to start asking patients to “like” your page. You can do this by asking them personally, by emailing them, and by doing little contests or giveaways. Notice that both these practices have thousands of likes. They’ve been working at it. And they have hundreds of posts by them and by patients. This matters for two reasons. First, viewers want to see new posts and lots of them. That adds credibility. Second, the search engines look at the posts. Google, Yahoo and Bing are looking at your fan page (they can’t see Facebook personal profiles), and they are indexing them as one of the factors in determining the relevance of your website. In other words, better SEO. Ask patients to post on your wall while they’re in the office. (A previous blog talks about the easiest way to get results.) And remember, your own posts on Facebook should NOT BE CLINICAL. Facebook is about showing the personal side of your practice and your team. Post fun stuff: your Halloween pictures, favorite patient of the month, team member profiles, sponsorship events. Be a part of your community, and show it. So what should patients post? Something simple, like “I’m here getting my teeth cleaned, and I always feel better afterwards. And I love everyone who works here!” To which your team member should respond with a commend like, “We love it when Sarah comes in—she always brightens our day!” And remember, happy patient has much more impact in a photo than in just a review. And video testimonials are also nice. Don’t forget about HIPAA. If you put up a photo of a patient, don’t talk about the clinical aspects of their smile. If the patient puts the post up themselves, they can of course say whatever they want. And make a habit of getting releases from your patients to use their image in all media, including social media. The new Facebook Timeline has some excellent features, including being able to “pin” posts that you like and keep them up at the top of your page. Take advantage of them. Facebook now also makes it much easier to do special offers. Try a few of those. They don’t cost anything. Welcome to Facebook and social media. There are levels and levels of customization that you can do, with help, to improve your look and response rate, but this will get you 80% of the way. And I’ll say one more time, the primary purpose of your Facebook page is to personalize your practice, and make it possible for your own patients to refer you easily, and for people in general to get a feel for the experience of being a patient. If someone tells you they can get you hundreds of new patients through Facebook, don’t believe them. It’s one part of your whole marketing plan, not all of it. This entry was posted in Advertising, Dental Marketing, Online Reviews, Social Media, Uncategorized and tagged advertising, dental marketing, dental practice marketing, Facebook, Online Reviews, social media by Fred Joyal. Bookmark the permalink. Thanks Fred, Great info. Love the step by step approach. Looking forward to creating our Facebook page here at Dr Balas’ office.